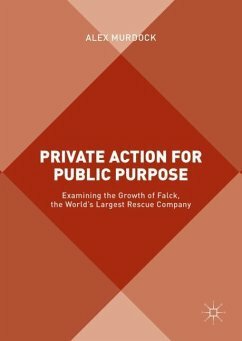 This book analyses the private provision of rescue and emergency services, and focuses on the emergence of the world's largest rescue company, Falck. The author's structured academic perspective is informed through close co-operation with Falck, which operates in 44 countries and across 6 continents. The chapters examine aspects of reliability, culture, innovation, trust, governance and business development within rescue and emergency services, including differentiation, internationalisation and globalisation. Drawing on detailed case studies of Falck's global work in the USA, Columbia, India and Denmark, Private Action for Public Purpose is instructive for students and researchers of business and management, and will provide value for emergency responders, managers, policy-makers and organisations involved in emergency response and crisis management. Alex Murdock is Professor Emeritus at London South Bank University and visiting Professor at the University of Potsdam in Germany. His research focusses on the intersection of the private, public and non-profit sectors, and he has worked at Copenhagen Business School, Denmark and the Sorbonne in Paris, France. Alex has held senior government posts in London, England and trained as a Probation Officer. Part I. .- Chapter 1. The Emergence of Falck; Alex Murdock and Frederik Madsen.- Chapter 2. Investigating Reliability and rescue; Anton Bradburn.- Chapter 3. Trust and the Public Sector; Christiane Stelling.- Chapter 4. innovation in Products and Services; Alex Murdock and Stephen Barber.- Chapter 5. Governance and Ownership; Alex Murdock.- Chapter 6. Diversification and Growth; Alex Murdock.- Chapter 7. Internalisation and Globalisation Post-2004; Alex Murdock.- Chapter 8. Culture and Core Values; Alex Murdock.- Part II. Case Studies.- Chapter 9. Grupo EMI and Falck in Latin Ameria: Working Together; Alex Murdock.- Chapter 10. Responce in Denmark: From Competitor to Partner; Alex Murdock and Margit Physant.- Chapter 11. Falck in India: A Challenging Market? ; Alex Murdock.- Chapter 12. Falck and the US Ambulance Market: Run Silent, Run Deep? ; Alex Murdock.- Part III. Conclusions.- Chapter 13. Conclusions and Looking to the Future; Alex Murdock.